Workers had one career their whole life. They worked for one company long term. Employees could predict how and when their pay and work duties would increase. Employees would do exactly the work an employer told them to do — and no more. There were many manual labor jobs in the production industries. Most people worked full time for one employer. Employees who worked hard and were loyal got good pay and job security in return. Workers have many careers and jobs in their lifetime. 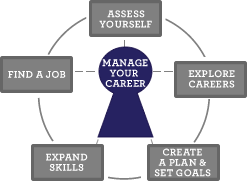 Workers create their own career paths within one or many employers. They have more say in their own pay raises or change in duties. Job duties change more often or match projects. Employers want workers who think for themselves. More jobs are in the service or knowledge industries. Workers need to be creative. They need to provide good customer service. They also need technical skills. Employees might work full time or part time. They might be short-term or contract workers. They may work for more than one company at once. Employees need to work hard and take charge of their own career goals. They get pay and training from many employers. Be able to Deal with Changes.